Seriously, I need to rename this My Weekend Favorites… who cares about the alliteration. I still need to catch up on Scandal , Suits, Chicago Fire & PD, and Law & Order SVU. But I am finally caught up on Nashville and Grey’s ( can we talk about Isaiah Washington coming back? And Ellen Pompeo saying that it is so top secret there won’t even be a table read of the episode??) My pick this week again is Parenthood. The scene with Christina and Adam driving Max back from his class strip early was so heartbreaking. I was in tears. I love this show! Homesteading Supplies You Can Get at the Dollar Store from Little House Living – Now that I am back to teaching full time – The Dollar Store will rotate back onto my list of store I visit often! This posts points out things you pay much more for in other stores, but can easily get at the Dollar Store. Stacking up on greeting cards is great. That way you always have cards on you if you need one last minute! 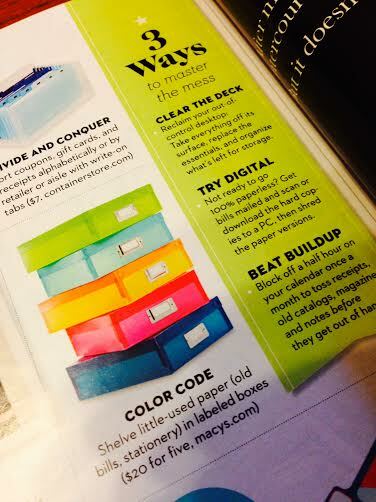 Good Housekeeping (April 2014) – How to Eliminate your Paper Clutter – Paper clutter drives me crazy! And I admit I make little piles and then my table is overflowing with paper! I have tried to go paperless – with bills and magazine subscriptions to my Ipad – but somehow I still have so much paper all over all the time! This article has some great tips. And anything that suggests Color Coding is for me! The article is not online – but here is a link to a similar article also from Good Housekeeping. 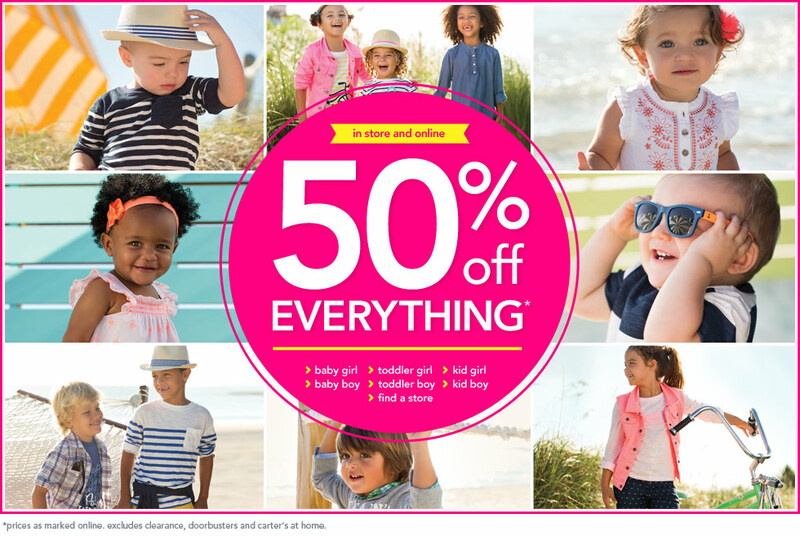 Carter’s – 50% off everything! In the store or online. Olivia and I went yesterday. The clothes are already a little pricey in my opinion, so even with 50% off it’s still more than I would want to spend. But 50% off the things on clearance – that’s a bargain! 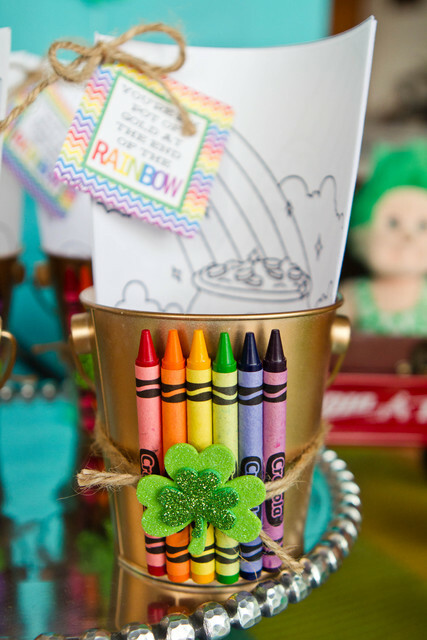 I know St. Patrick’s Day is over, but my Pinterest page still seem to be all green and rainbows and Pot of Golds! I saw this on craft on Pinterest and thought it was a cute way to celebrate March 17. Hope you have a great Sunday and a fabulous week next week. Anything you are loving right now? Leave me a comment and let me know. Thanks for reading! I love Parenthood. I have been following it since it started. It is one of the few shows that I watch that is actually just a normal family show that has nothing to do with horror or ghosts or fairy tales. I love every character and all their flaws. The other show you mentioned that I watch is Chicago P.D. I stared watching it because Sophia Bush (OTH) is on it. Love her and miss OTH sooooo much! Turns out, I enjoy this show too. Win-win! How is the teaching going? I have been meaning to ask you: where are you teaching and what grade??? Those kids are lucky!!!! Hey Maria – I love Parenthood too. I have been watching i from the beginning. The only things that bothers me is that they never even mention Hattie anymore. I know she is in college – but her mom ran for mayor and we never heard from her… a visit, a phone call, a mention? I recently started re-watching the earlier seasons on netflix. She was such a huge part of the show ,,, the whole Alex story line was so good. I love Sophia and OTH too! But you must watch Chicago Fire …. PD is a spin off – and there are a lot of cross storylines… Sophia is on Fire a lot. Larry and I just watched Chicago Fire on Netflix a few months ago to prepare to start watching PD. It’s good – you would like it! I’m at a charter school in North Philly — teaching Reading and Writing to 7th and 8th grade. Hope all is well in Florida – I’m sure you don’t miss all this snow. It’s suppose to snow again this week. I am losing my mind!!!! !